Indiana State University student Meghan Hoskins was surprised to learn that, although segregation is against the law in the U.S., it still permeates one of the cities that served as a backdrop to one of the nation's most prolific struggles during the Civil Rights movement. Hoskins was part of a group of 14 Indiana State students who traveled to Selma, Ala., as part of an Alternative Spring Break trip. While some of their peers traveled to more traditional spring break destinations, the group journeyed to Selma to learn more about the city's history, the Civil Rights Movement, how efforts for equality continue today and the ways that the students can peacefully and positively impact the effort. "It's literally like a time warp. It's like ‘why is this here today?'" Hoskins, a sophomore psychology major from Mooresville, said of the existing segregation in Selma. "This was supposed be done away with a long time ago, and it wasn't, and I think a lot of people think racism and segregation don't exist anymore when they do." The trip included a packed weeklong itinerary. 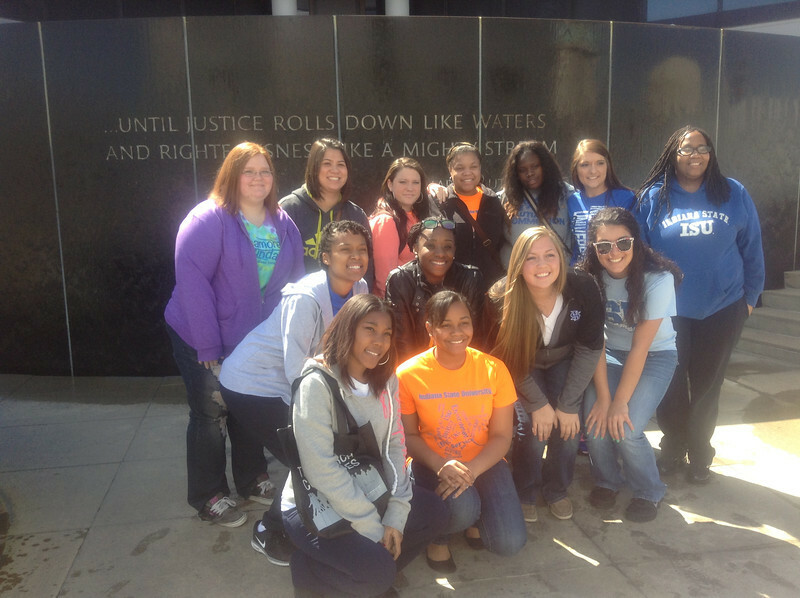 The Indiana State students toured Selma, several places in nearby Montgomery, Ala., the Rosa Parks Museum and visited local schools. They also worked with students in the Random Acts of Theater Company (RATCo) from the Freedom Foundation, which organizes and hosts the Alternative Spring Break trips in Selma. Some of the local children participating in RATCo explained to the Indiana State students about some of the struggles they have encountered, and how the theater company helped them. "When I got here, I thought we're going to help guide the children on the right direction. I didn't think anything about feeling what they feel, and then comparing it with my own experience," said Terrin Benson, a junior from Indianapolis majoring in human development and family studies. "This experience has been very touching and inspiring." The Indiana State students volunteered at different locations, including a center that provides Head Start programs. Benson helped young children with their numbers, colors and alphabet sounds. The ISU students also participated in nonviolence training in approaching civil justice issues. "Everyone is excited about the work that we've done here and looking forward to continuing to work on some of these issues, not just whenever they're able to return to Selma, but infusing these ideas and ideals into campus and neighborhoods as well, where we live," said Dwuena Wyre, assistant professor of human resource development and performance technologies. She was the faculty advisor on the trip. The Selma tour included sites and information that was integral to the Civil Rights Movement, including the Edmund Pettus Bridge, where 600 people marching en route to Montgomery were attacked by state and local authorities. March 6, 1965 became known as "Bloody Sunday," and the march efforts culminated in the Selma-to-Montgomery journey that occurred from March 21-25, 1965, and had drawn support from about 25,000 people. "Reality hit when I came here, because back in school we just learn about it and do not get to experience it," Benson said, "but coming here really turned my whole thinking process around." The march, which was a call for voting rights equality for African-Americans, resulted in U.S. President Lyndon B. Johnson signing the Voting Rights Act of 1965 - a component of which is currently being reviewed by the U.S. Supreme Court. The spring break experience also inspired Wyre, a Louisiana native who remembers learning about her grandfather's involvement in the Deacons for Defense and Justice, who provided security to civil rights leaders in Louisiana while also registering people to vote, Wyre said. Her grandparents also participated in a civil rights march in Louisiana from Bogalusa to Baton Rouge, Wyre said. While these activities occurred before she was born, the Indiana State professor remembers her grandparents still working later in life for voting equality, registering people and working to transport people to the polls on Election Day to vote. As a teenager, Wyre even served as a dispatcher, helping to arrange for rides so that people could travel to the polls. The trip "was a way for me to basically connect with my (family) legacy," Wyre said, "and to basically give me closer personal insight as to what they endured during that time." The Indiana State students learned lessons through different activities, which included skyping with Bernard Lafayette, a prominent civil rights activist who provides nonviolence training to groups across the globe. They also received nonviolence training from Jonathan Lewis, the founder of the Positive Peace Warrior Network. Hoskins said one of the most memorable lessons she took away from the nonviolence training that the students received was to suspend all first judgments before gathering further information, which basically means to not judge someone before you get to know them. "The first time you see somebody, everybody makes snap judgments, and they have no idea who (the person) is," Hoskins said. "They have no idea what they've been through ... and it really limits us as human beings to make those judgments and then never get to know people." Lafayette taught the students that responding in a peaceful manner can be intimidating to people who are hoping to elicit a violent reaction, which was inspiring to learn, Benson said. "He explained how he overcame hatred, and how he portrayed the nonviolence back then was very intimidating to the white men, because they weren't expecting him to do what he did, to just sit there," Benson said. "They expected him to blow up, or get up in their face and try to fight back, but he didn't." Photo: http://isuphoto.smugmug.com/Other/Media-Services/Alternative-Spring-Break-2013/i-qnz668c/0/L/photo-L.jpg (Submitted photo)A group of Indiana State University students that traveled to Selma, Ala., on an Alternative Spring Break trip to learn more about the city's history and the Civil Rights Movement. 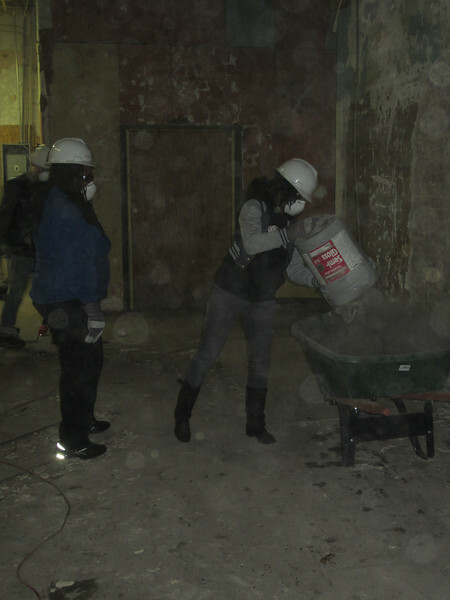 The group also volunteered at several local organizations and learned about nonviolent resistance. Photo: http://isuphoto.smugmug.com/Other/Media-Services/Alternative-Spring-Break-2013/i-GHT756c/0/L/ASB%202013%20089-L.jpg (Submitted photo)Several Indiana State University students volunteer to work on a building for the Freedom Foundation, which organizes Alternative Spring Break trips to Selma, Ala. The organization teaches people about the history of the area and the Civil Rights Movement, among other lessons. Fourteen students traveled to Selma, Ala., as part of an Alternative Spring Break trip to learn more about the city's history, the Civil Rights Movement, how equality efforts continue and the ways that the students can peacefully improve things.